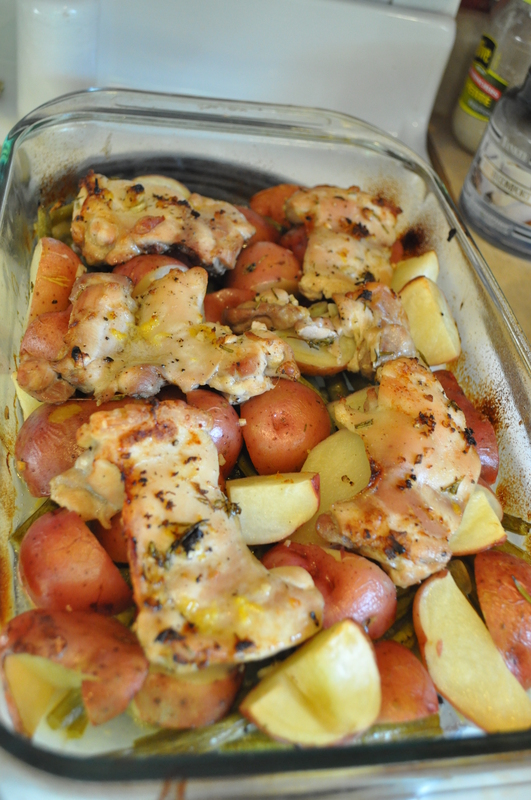 This recipe is a good start for a lemon chicken, though I think it needs some tweaking. Maybe less lemon and more herb/garlic. Let me know what you think would improve this. Preheat oven to 450°F. Coat a large baking dish or cast-iron skillet with 1 tablespoon of the olive oil. Zest one lemon; then with a sharp knife, cut off the white pith. Slice the lemon and arrange the lemon slices in a single layer in the bottom of the dish or skillet. In a large bowl, combine the remaining oil, lemon juice, lemon zest, garlic, salt, and pepper; add the green beans and toss to coat. Using a slotted spoon or tongs, remove the green beans and arrange them on top of the lemon slices. Add the potatoes to the same olive-oil mixture and toss to coat. Using a slotted spoon or tongs, arrange the potatoes along the inside edge of the dish or skillet on top of the green beans. Place the chicken in the same bowl with the olive-oil mixture and coat thoroughly. Place the chicken, skin-side up, in the dish or skillet. Pour any of the remaining olive-oil mixture over the chicken. Roast for 50 minutes. Remove the chicken from the dish or skillet. Place the beans and potatoes back in oven for 10 minutes more or until the potatoes are tender (mine were already tender at this point). Place a chicken breast on each of 4 serving plates; divide the green beans and potatoes equally. Serves 4. I think it sounds delicious.. just pop a bright green salad on the side and dinner’s served!! I’d love this one! My lettuce is overwhelming me right now! Good thing I like those good salads. I think it looks good, but a little rosemary or oregano would be great in there too. Yes… or thyme- my new favorite herb.